This 29th episode has finally given us another Patrangers story. Sadly, it is an amnesia story which is is a very tired plot line. However, this season has proven it can make a basic plot fun, but also terrible. Which will happen this time? Click "read more" and we shall find out. The episode begins with Sakuya proposing that they throw a welcome party for Noël Takao because he never received one from the Global Police and that Noël Takao could organize it himself. Organize his own welcome party? Well, that talk gets cut off when they come across Goche and some Pordermen. 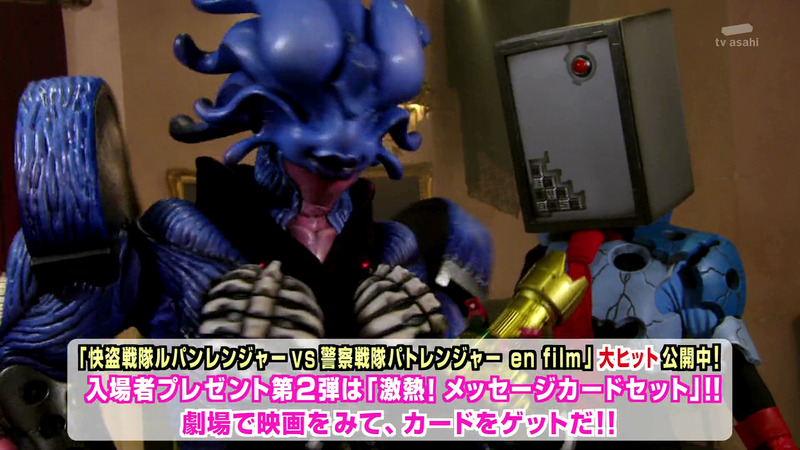 Coincidentally, the Lupinrangers are having the same idea for a party for Noël Takao when they see the fight that broke out between Goche, the Pordermen, and the Patrangers. Does this city only have one big sidewalk? This fight turns out to just be a trap for Goche to experiment with her new amnesia powers and she uses them on Keiichiro causing his memories to scattered into photos. Ooh! A plot and a collectible. Keiichiro's memories are not completely gone as he still remembers Tsukasa but not Sakuya implying that it may be only a few years lost. Cut to intro. Just like that, 2 minutes in and the plot is nicely set up. Not bad. One theme song later, the Patrangers are trying to figure out how to help Keiichiro. 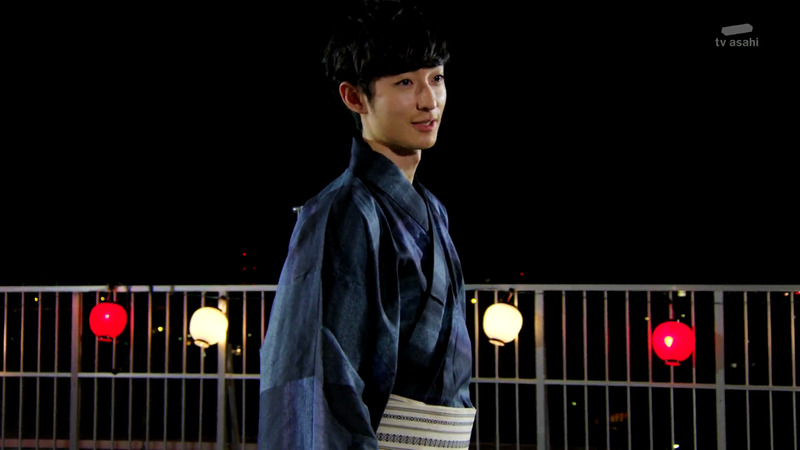 What follows is a clip show of past episodes from the Patrangers point of view as they try to jog Keiichiro's memory. Oh no, not another cliche plot. One good note though. 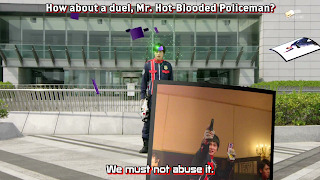 There is a funny 4th wall joke where Keiichiro confuses Commander Hilltop as a famous Hollywood actor when he actually is played by a pretty famous actor. A couple minutes later, the flashbacks aren't jogging any memories for Keiichiro, so Noël Takao proclaims there must still be some photos missing so Sakuya and Tsukasa go searching for them. 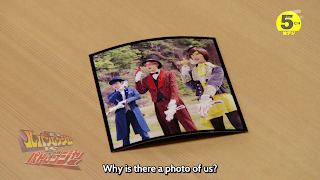 Back at the Lupinrangers Bistro, the three of them have taken one of the photos assuming that it is real and wonder who took it. The sight of this photo causes the 3 of them to have a trip down memory lane. More clip show! Dared to think it could be quick. Once their clip show is over, Noël Takao appears and tells them what happened and that this photo is part of Keiichiro's memory. Cutting to the Ganglars HQ, Goche states how a mear Porderman is unable to fully harness a collection pieces power. 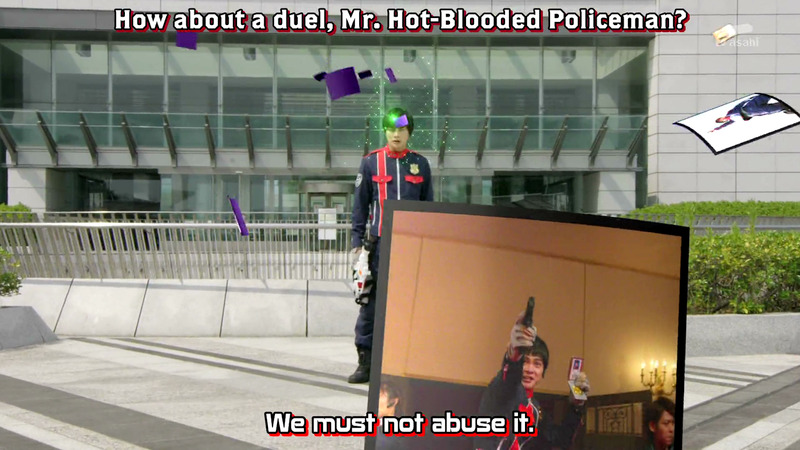 (This is why Keiichiro didn't lose all his memories.) This chat, once again leads into a clip show, this time of past Ganglar battles. I think you know where this episode is heading by now. Back at the Bistro, it is now Noël Takao's turn to have a series of flashbacks. If you really want to know, they just say when the photo takes place and proceed to tell their entire story throughout the season so far. Shockingly, a little bit of plot development is here. 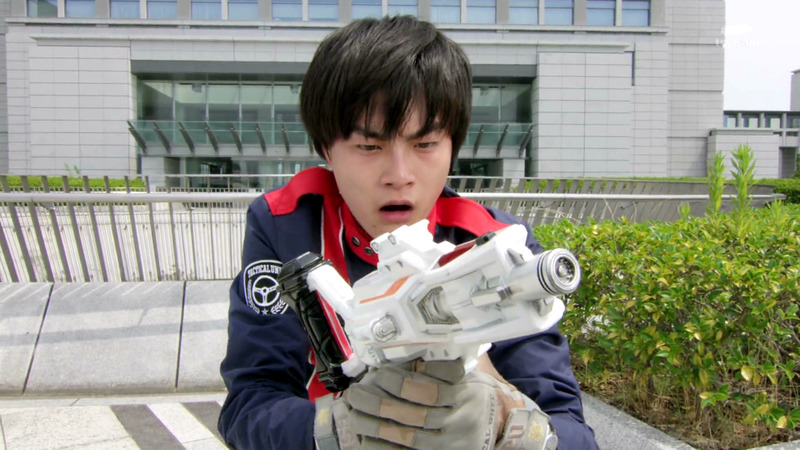 The Lupinrangers ask Noël Takao why he has both the Patran X and Lupin X powers and he replies that he believes that both the police and phantom thieves are necessary. This statement, is quickly shot down by the 3 main Lupinrangers as all of them see the Patrangers as a threat of destroying a collection piece. I'm interested in this a lot more than the clip shows. It seems Noël Takao might be the neutral party I was hoping for after all. 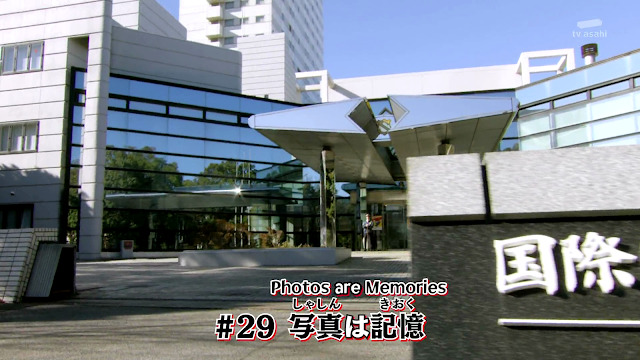 Tsukasa and Sakuya find a few more photos and having more flashbacks, but more importantly, Keiichiro has run off. Seeing some of his photos may not have fixed his memories, but they did trigger his desire to fight for peace. That's pretty deep. 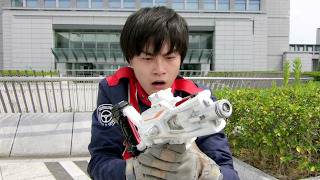 Keiichiro rushes to save a civilian from a Porterman attack and fights them unmorphed. Pretty convinient there happen to be trouble when he decided to storm off. He is holding his own but freezes when he sees his VS changer. To be fair, this is a normal response for a cop when finding one of these things in their holster. At this time, the Phantom Thieves show up and begin fighting the Pordermen after taunting Keiichiro a little. Obviously, if they didn't choose to restore Keiichiro's memories than the characters could never be redeemed. However, it is still nice to see some unmorphed fights, even just for a short time. 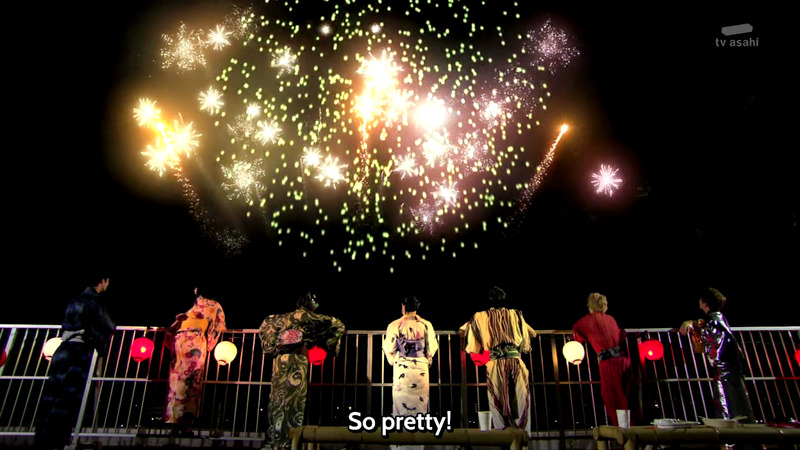 Watching the phantom thieves fight jogs all of Keiichiro's memories and all the photos fly back to him. Does that mean they didn't need to be collected? 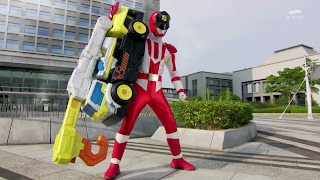 With all his memories back, Keiichiro screams out is usual catchphrases, henshins up, and unleashes a new form with his Crane VS Vehicle. Lame! This is something little kid me would have designed with access to toys and glue. 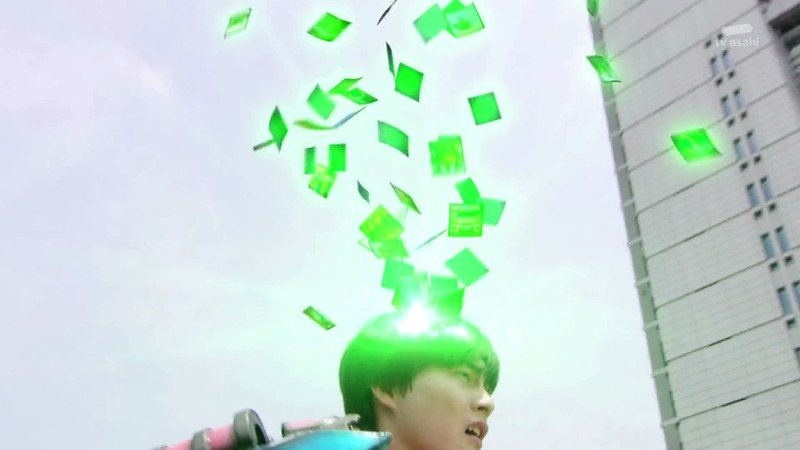 The Phantom Thieves steal the collection piece from the safe head Porderman and Keiichiro destroys the remaining Pordermen. Goodstriker appears only to be disappointed that there is no giant monster this time but does have a series of flashbacks about all the past giant mech combinations. Just couldn't resist another clip show. 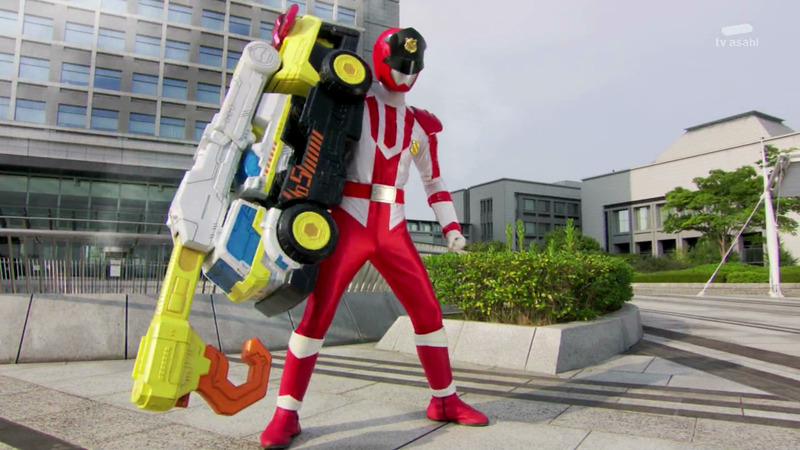 This one only shows off how much more attention the Lupinrangers are getting. 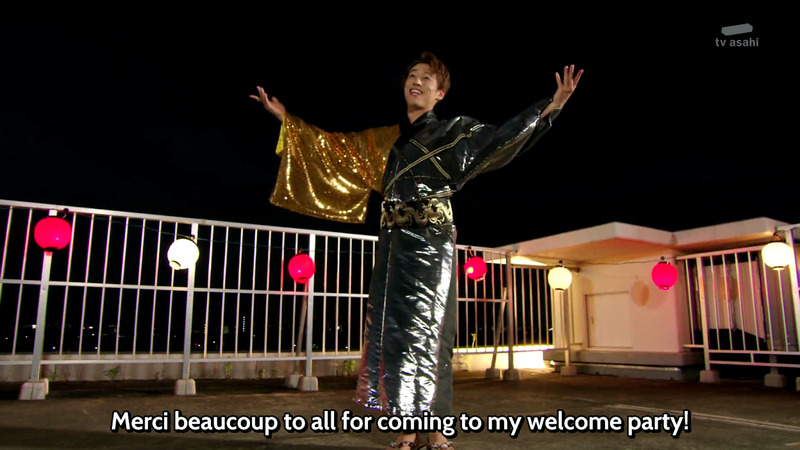 The episode ends with Noël Takao welcome party that he did in fact host himself. 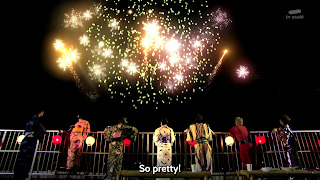 It is a big Yukata party with expensive food and fireworks and with both teams present. 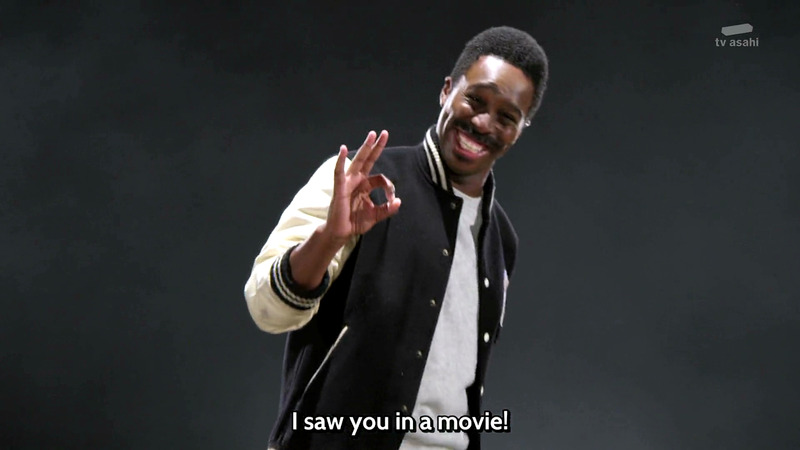 I see that I appear in this episode. - Black Diamond.